Trees trimming is an essential part of tree care and maintenance. Careful tree trimming can not only prolong the life and improve the health of the tree, it can also mitigate the risks of property damage resulting from falling branches and trees. Recently storms and cyclonic winds have highlighted the importance of a careful tree trimming and maintenance schedule with thousands of homes and buildings damaged as a result of improper maintenance. Jim’s Trees are New Zealand’s largest network of arborists with decades of tree trimming, pruning, tree removal and stump grinding experience. 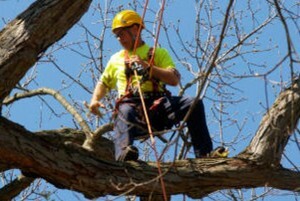 We’ve handled all kinds of tree care jobs imaginable and are committed to giving you the best advise when it comes to tree trimming and maintenance. We offer professional advice during every step of our engagement process and make sure you are aware of all options available to you. You may not know how to solve your tree problems, so we will discuss all the options with you and suggest the best solution for you. The final decision is always up to you to choose. Why Use Professional Tree Trimming Services? The value you get out of your trees will depend on the effort and care you put into them. If you take care of your trees, they will grow fruits and flowers for you during the year and bring you shade from the sun. They can also be used to beautify your land and add value to your property. But trees that are not cared for and are neglected can become home to pests and may start to become weak or decay. These trees can also become infected by fungus and other organisms that sap their strength and decrease their beauty. 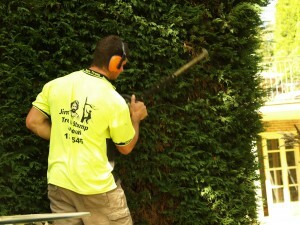 At Jim’s Trees we provide all the services and expertise to make sure your trees are protected and well maintained. We have all the equipment to prune and care for your trees, ensuring they have long, healthy lives. We know your trees are important you, and we want you to be able to get the most out of them. That’s why we offer a full range of services for your trees that include expert inspections, pest control, tree care, tree and stump removals, and much more. Trees have always been an important source of food, shelter, and oxygen for people. And in the modern times, many people have made use of trees as a means to add beauty to their land. It’s not uncommon to find a tree in most yards and even on the grounds of corporate offices and retail structures. But trees are also natural products and living organisms that grow, flourish, and then decay and die. It is a natural lifecycle that they all have to go through. And once trees start to decay, they can pose a danger to people and their property. Their branches can fall and cause damage, or the trees can become home to pests. We know the value of these amazing plants at Jim’s Trees. For years, we have been bringing tree care and maintenance services to our valuable customers. We have built up a reputation of high quality work that meets the strictest standards. We are committed to our customers and to meeting their needs for tree care. Trees have a value to your property that cannot be replaced. They provide natural shade and oxygen, and they bring beauty to your land. These natural forms of decoration are perfect for rural homes or metropolitan businesses, but after a while, they can start to pose a danger to the people and property around them. As trees begin to decay, they branches and trunks become weak and may potentially fall and cause damage. Trees that are not cared for can grow where they are not wanted, become unpleasant to look at and lose their luster very early. But by having your trees professionally pruned, you can keep them from growing over your windows or into your patio or porch. You can also keep them from overgrowing power lines and from posing a danger when sever storms hit the area. 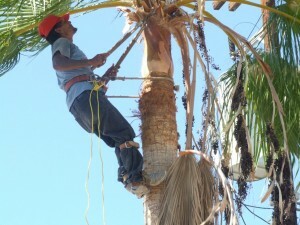 Palms can be a great way to beautify a property and add value to it. But you have to know that your palm trees won’t be around forever. Once palms start to decay, they can become a danger to you and your property. Sometimes you just want to get rid of your trees because they are impeding your plans for a garden, lawn or an addition on your home. Whatever your needs, we at Jim’s Trees are ready to help. 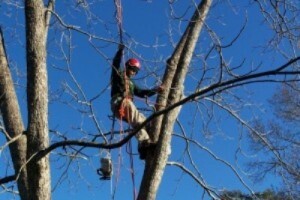 We bring years of arborist services and expertise to each job we do. We can perform all tree cutting, pruning, lopping, and removal services that you require with unrivaled professionalism and friendliness. Palm trees, as you may be aware, are incredibly sturdy. It can take a lot to fell one, which means it can be dangerous to try to remove them yourself. That’s why we recommend you only use professional services for all your palm removal needs. We have the tools and training to get the job done safely and quickly.